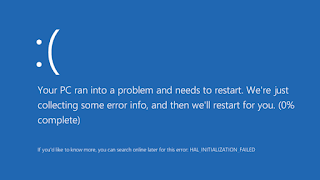 windows 10 is software just like its predecessors, so from time to time things go wrong. It happens remarkably infrequently in our experience. but we’ve put together this short guide to help you get back up and running. if you ever see the infamous Blue Screen of Death or blue screen crashes (BSOD). There’s no magic bullet solution that fixes all ills. but if you work through the following tips you should be able to diagnose, and hopefully fix, your particular issue. We think that Windows 10 is an excellent version of the OS, with a lot to offer. especially now there’s the Creators Update, which is another free update. We store many important files on our computers – from family pictures and videos to important business documents – and all of this can be lost very easily if you don’t create regular backups. While you should be doing this all the time anyway. if you’re beginning to experience problems with your PC then creating a backup needs to become an immediate priority. It’s tremendously frustrating to lose precious data needlessly, and the whole process can be completed in a very short time. You can either use dedicated backups solutions .such as those found in our guide to the best backup software. It‘s helpful to make a note of what you were doing and which programs were running when you experienced the blue screen. If you’re able to recreate the process and end up with the crash. Then there’s a good chance that one of the pieces of software you are using could be causing the problem. In any case, knowing that the crashes are not random, but instead caused by certain actions, can narrow down the suspects. For example, if you notice that whenever you connect a printer via USB. And try to print from Word you get a BSOD. But if you print to PDF you don’t, then it’s reasonable to assume the printer is involved. Alternatively, head to the forums on the manufacturer’s site to see if there are known problems with the update. 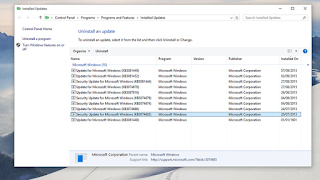 To uninstall a program or driver you’ll need to click on the search area in the taskbar then type view installed updates and select the option that appears with that name. Now you’ll be taken to the Control Panel where you can check the dates of the drivers. Than uninstall the ones that might be causing the problem. Another obvious thing to check is that Windows itself is up to date. To do this click on the Start button and click the cog icon, then click on Update & security. When the Update panel appears to click on Check for Updates. If you’re on a desktop PC. Then it could well be worth opening up your machine and ensuring that the hardware is all seated correctly. If a card isn’t fully pushed into its slot. Then there is the outside chance that it might cause the crashes. Of course, if you’ve upgraded a graphics card, or maybe your RAM, recently then this would again be a thing to investigate. As the new hardware could be causing the problem. If you’re still having trouble, Microsoft has a troubleshooting guide as well.